Our fashion coverage of leggings this summer has not been in short supply, but believe it or not, there are still plenty of facets to discuss when it comes to these curve-hugging friends of ours. Sure, we’ve told you the dos and don’ts of washing them, how to get away with wearing them to the office, and even the worst kinds to wear while getting your sweat on. However, today we’re getting fancy and telling you how to do leggings runway-style. Though usually reserved for a casual weekend errand or yoga class, the F/W 16 catwalks dispelled these legging stereotypes and showed us how to incorporate them into stylish ensembles we can wear every day. That’s right; comfortable leggings and a cool outfit are not mutually exclusive. See below for examples from labels like Céline and Valentino, and if you need a new pair of leggings to add to your wardrobe, shop our picks. Also, we want to know what you think about leggings as a serious fashion item, so tell us your thoughts in the comments. Phoebe Philo introduced not one but several leggings on her F/W 16 catwalk for Céline. Layered underneath dresses like this wrap-front version, they felt similar to what a modern dancer would wear on her way home from the studio. This athletic brand is a celebrity favorite. Who would’ve suspected a pair of leggings to be included in a couture collection? How pretty are those ties around the ankles? Layer a long dress over these white leggings so as to only show a sliver at the ankles. Whether you’re headed back to school or back to the office this fall, we think this is a smart way to pull off a (mostly) head-to-toe noir look. Go from barre to bar in this breathable pair. Okay, so perhaps this ensemble is a bit more conceptual than how you normally dress, but we love the idea of scrunchy leggings and sandals. Toss a chunky knit on top for a more approachable take. Keep classic leggings on hand at all times. Who needs tights when you have lace leggings instead? 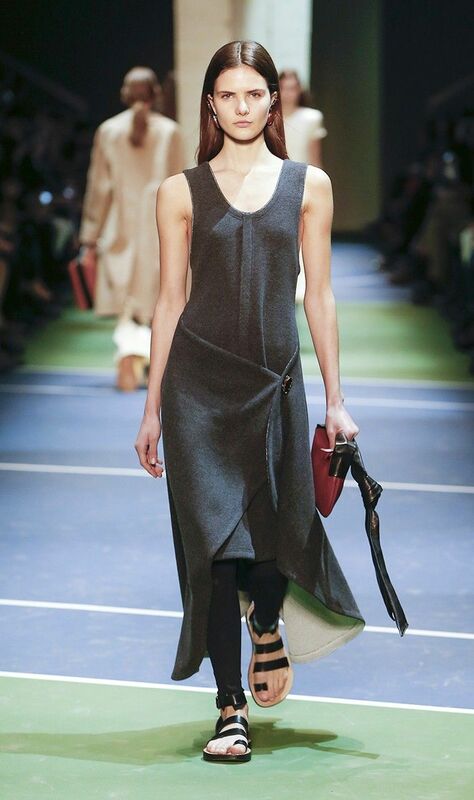 Though the turtleneck and slip dress would be beautiful on their own, the black leggings in this Valentino look add an unexpected proportion that we appreciate. You count on The Row to make the fanciest leggings in town. A mesh insert is a cool update to your standard black. See more ways to wear your leggings.